It is feasible to load a Spring Application Context through a RAR. According to the Java EE specification the Resource Adapter Archive (RAR) is an archive that contains certain resources for Java EE Connector Architecture (JCA) applications. The exact explanation is available on . The structure and packaging is presented on . In a META-INF/ra.xml file inside a RAR, there is declared SpringContextResourceAdapter and specified a ContextConfigLocation property with value addressed to a Spring Application Context XML configuration. The generic idea and configuration is given on . In this example context configuration is placed somewhere under META-INF in a classpath. Prepare a spring artifact with a Spring Application Context. Prepare a RAR resources following official guideline . In a RAR/META-INF/ra.xml set appropriate ContextConfigLocation to a Spring Application Context configuration location. The Spring Application Context can be included inside a RAR itself or can be placed in an outside resource when a RAR is deployed in an EAR. Assemble a RAR as a standalone archive or inside an EAR. A pretty simple system was designed to illustrate how a loadable Spring Application Context inside an EAR works in action. com.softexploration.lab.transfer.money.app plays role of server and com.softexploration.lab.transfer.money.client plays role of client. The purpose of this system is to allow transfer money on server side on requests received from clients. 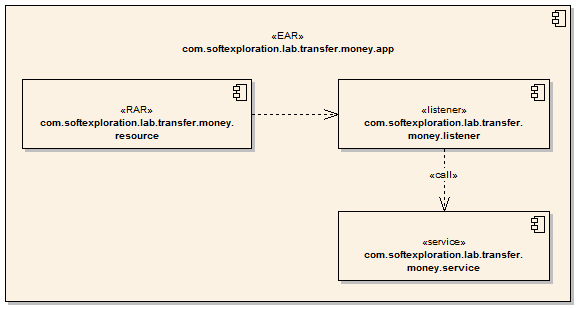 There is presented a simple com.softexploration.lab.transfer.money.app which uses a RAR to load a Spring Application Context. This is an EAR application (com.softexploration.lab.transfer.money.app) which contains two spring artifacts (com.softexploration.lab.transfer.money.service, com.softexploration.lab.transfer.money.listener) and a RAR (com.softexploration.lab.transfer.money.resource) which refers directly to the main artifact (com.softexploration.lab.transfer.money.listener). Application receives requests asynchronously through a MessageListener and then responses sending a JMS message to a destination specified by a requester. Project has a Maven structure and is presented in Figure 3. This is a simple Java client which sends request to make a money transfer. App com.softexploration.lab.transfer.money.client has Maven artifact structure. Apache ActiveMQ TM is the open source messaging and Integration Patterns server. It is used here to transfer messages between Money Transfer App and a JSE Client. Now both the server and the client side are compiled and the messaging server is running. This post could give an approach to prepare a Java EE application with a loadable Spring Application Context. The pivotal part is a configuration inside a RAR/META-INF/ra.xml file. Simple demo is a complete solution which uses a RAR assembled within an EAR. If you are interested in the simple demo system you can go for source code in the Resources section.